This 2019 reimagining manages to both improve upon the 1989 adaptation and reach Stanley Kubrick-like heights with its unnerving imagery. It’s a horror film made by horror fans who know how to expertly crank up the tension and leave you with an untreatable hangover of fear. 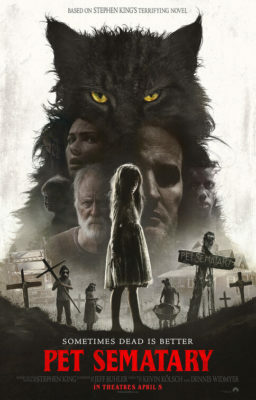 Written for the screen by Jeff Buhler (THE PRODIGY, another surprisingly fantastic horror film), PET SEMATARY follows the Creed family as they search of a better life together. Dr. Louis Creed (Jason Clarke) and his family – wife Rachel (a damn-good Amy Seimetz), daughter Ellie (a screen-dominating Jeté Laurence) and Gage (portrayed by twins Hugo and Lucas Lavoie) – have relocated from the big city to the small rural town of Ludlow, Maine. Their new house is dangerously close to a highway (overrun with semi trucks driving at MAD MAX speeds) and a pet cemetery. Despite these red flags, everything seems to be looking up for the Creed family – especially with their eccentric-but-friendly neighbor, Jud Crandall (the great John Lithgow), showing them the small-town ropes. Well, that’s until Ellie’s cherished cat is inadvertently killed. Desperate to make his daughter happy (and his wife, because she’s not ready to introduce their children to the concept of death yet), Louis follows his neighbor Jud to an ancient graveyard imbued with mystical, reanimating powers. And despite the results taking a turn for the worst and the unrelenting warnings from a recently deceased young man (Obssa Ahmed), a tragedy-stricken Louis returns to the cemetery in hopes of a different outcome. As Kölsch and Widmyer noted during the post-screening question-and-answer session at the film’s world premiere at the South by Southwest Film Festival, they wanted to capture the essence of King’s original text while also taking certain careful liberties to make the material uniquely their own. They shake up the order of story elements and also make a few significant changes (arguably for the better) that will play with your expectations. Fans of the novel and Mary Lambert’s film will sniff for the familiar beats; and just when you think you know what’s coming, Kölsch and Widmyer throw you off with a new scent. Iconic moments are thrown in a Yahtzee cup and shaken to cut even deeper at the film’s themes of death and grief. This adaptation also has more meat on the bone. No character — other than maybe Gage because he’s three — suffers the short end of the stick. Kölsch and Widmyer spend just as much time developing the children as the adult characters. Ellie enjoys dancing to “The Nutcracker” and conversing with Jud about his wife; Rachel is haunted by the death of her sister Zelda (a pants-soilingly scary Alyssa Brooke Levine); while Louis is trying to escape the insanity of his former life for a more peaceful way of living with his family. Everyone has their own baggage and obstacles to hurdle, and how they do so makes for good cinema. The same is true for Lithgow’s Jud, who gets many scenes where he pokes fun at the craziness that unfolds. His honest wit will leave you in stitches. This brings us to the unshakeable images that Kölsch and Widmyer drop off in our heads to follow us into our nightmares. There are a handful of moments that match the same feelings of terror when the elevator doors open in Kubrick’s THE SHINING and the blood comes flooding out, most of which involve Zelda and the way she contorts her body. There are also clever scenes of horror that play with the reality we know and only what would make sense in a dream. From the original film (and novel), there’s the scene of Louis returning to the cemetery in the middle of the night after being startled by someone he knows to be dead. He is shaken by what he learns and sees at the graveyard and awakes the following morning safe and sound in his bed. However, when he pulls back his bed covers, he sees that his feet are covered in dirt he tracked in from an all too real nighttime excursion. There are more moments just like this littered throughout the entirety of PET SEMATARY that fry up the nerves on high heat. The film is a remarkable piece of horror work that keeps the King-aissance alive and well. It’s easily one of the creepiest and most bloodcurdling King adaptations yet, and how it all wraps up will please the most diehard of horror fans. PET SEMATARY is very much its own animal of terror. 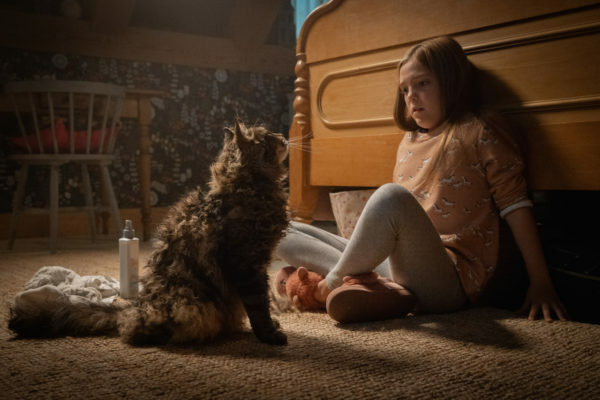 PET SEMATARY had its world premiere at the South by Southwest Film Festival in Austin, TX, on March 16, 2019. Paramount Pictures is releasing the film nationwide on April 5, 2019. Feature Photo: John Lithgow as Jud in ‘PET SEMATARY.’ Courtesy of Paramount Pictures.